After many routine surgeries, the patient is delivered to the post-anesthesia care unit or PACU for monitoring during their recovery. During this time-period, the patient is supposed to be monitored carefully to ensure that no adverse side-effects, complications or reactions occur as a result of the procedure itself nor of the medicines or anesthesia administered during the surgery. Failure to monitor the patient properly can have devastating effects. If your loved one was injured due to medical negligence and failure to monitor their vital signs in the PACU, you should speak to a medical malpractice attorney about the case immediately. Hypoxic-ischemic encephalopathy (HIE) is a type of brain damage that results from the deprivation of oxygen to the brain. One way this can occur in the PACU is by the staff failing to monitor a patient’s breathing patterns following the administration of narcotic pain medication. Opiates administered for pain relief such as Fentanyl or Demerol, are known to cause respiratory depression. Failure to monitor a patient’s vital signs while under the influence of such a powerful opiate drug can result in the patient ceasing to breathe and/or breath properly. Oxygen deprivation that results from this can lead to serious permanent brain damage. Another way hypoxic-ischemic encephalopathy (HIE) may occur in a patient while in a Post-Anesthesia Care Unit, is by way of respiratory collapse. This can be the result of a lung collapse or throat collapse. Throat collapse can occur in patients (particularly obese) patients who are unconscious and left lying on their backs unmonitored. This may be even more likely in patients who requires a tracheotomy. 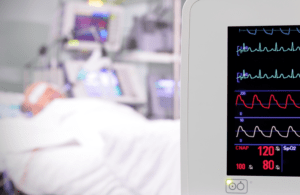 Regardless of the patient’s condition, proper monitoring of the vital signs should catch and allow doctors and nurses to prevent oxygen deprivation before it results in permanent irreversible brain injury. If you suspect that your loved one suffered a hypoxic-ischemic encephalopathy from oxygen deprivation due to the negligent failure to monitor their recovery in the post-anesthesia care unit, you should contact Simmons and Fletcher, P.C. for a free case evaluation. We accept calls nationwide and our phone is open 24/7 to discuss your case. The call is toll free, the consult is free and if we take on your case, we do not charge you a dime unless we make a recovery. Why not call us today at: 1-800-298-0111?